The Change Team has decided it will be a good idea for us to have a nominated charity which we support each year. They have chosen Compassion, a Christian charity, which works to provide education and health care for children living in extreme poverty in different parts of the world. On 14th January, a lady called Rhona, who works for Compassion, came to worship to explain the charity's work to the children. She showed photos of where some of the children live, and our pupils were shocked to see the mud huts without electricity or running water. They saw a video of a child explaining how the charity has made a difference to his life and Rhona explained how the project is designed to have a long-term impact on improving the life of the whole family. 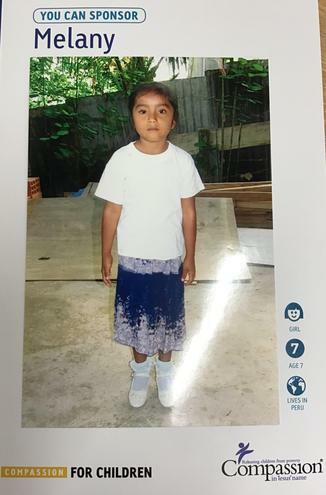 We have been allocated a little girl called Melany who lives in Peru. We will be able to exchange letters and photographs and the plan is that as out children grow and learn, we can help and watch Melany grow and learn too. The Change Team has decided to hold a sponsored cycle/scoot in order to raise the £300 we need to sponsor Melany's education and health care for a whole year. We will be sending home information before half term and we hope you will support the children to make a life changing difference.